Vietnamese Translator download - Translate Vietnamese to English and English to Vietnamese - Vietnamese translation software. 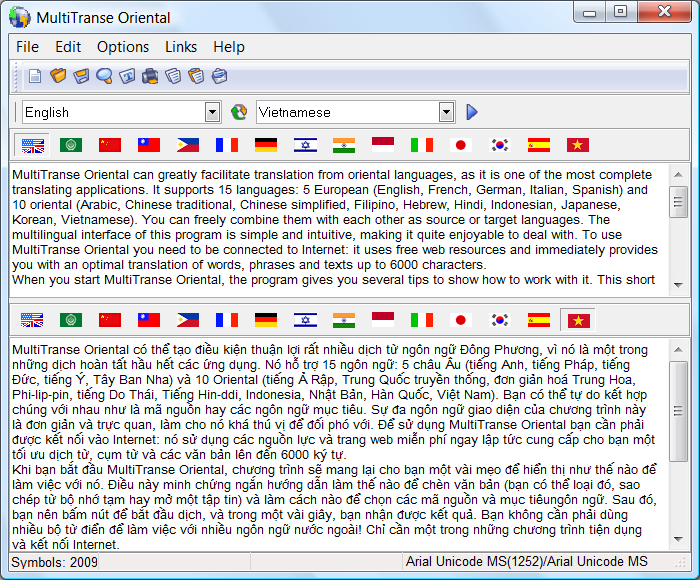 MultiTranse Oriental is a Vietnamese translation software that allows you to translate Vietnamese to English and vice versa English to Vietnamese. The program can translate Vietnamese words, phrases, sentences or even small texts, up to 6000 symbols at a time. So if you need to download Vietnamese translator MultiTranse Oriental is one software application you absolutely must have. MultiTranse Oriental is not only Vietnamese translation software - also supports translation with 15 different languages that include English, Spanish, French, Arabic, Chinese, Indonesian, Hebrew, Filipino, Korean, Italian, Hindi, German, Turkish, Persian, Japanese. The program is Unicode compatible, automatically determines font, encodes Unicode text into any ANSI format and the other way around. If the font is not found in the user's computer, the program offers an option to download it. The program comes with a multilingual user interface that is very simple and easy to use. First, you insert text, either by typing it, copying from the clipboard or opening a file. Then, press the button that identifies the language of the original. The next step is to choose the language the word, phrase, sentence or text needs to be translated to. Press the button to start Vietnamese to English translation. Important: You must have the Internet connection established! The results will appear in short time. Best of all, MultiTranse is distributed online as shareware, which means you can try it risk free at no cost to you. Download Vietnamese translator right now!